NATIONAL SPACE Trophy winner Robert Lightfoot ended his long NASA career on a perfect note with some 800 admirers giving him a grand sendoff at the RNASA Space Gala. Besides retiring from the space agency, Johnson Space Center Director Dr. Ellen Ochoa presented him with a beautiful trophy for his mantel. 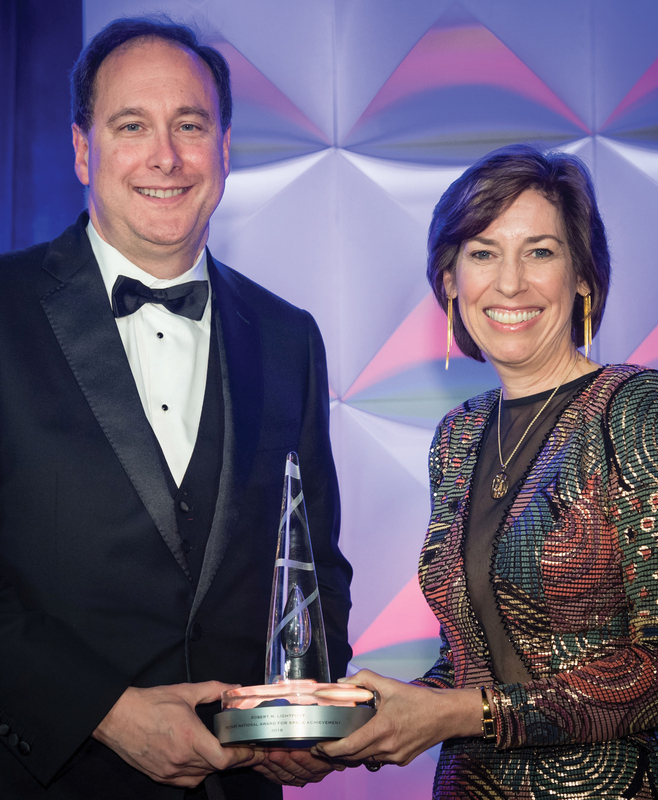 “The many leadership roles that Robert Lightfoot has held and excelled at over his entire aerospace career made him the ideal person to lead NASA during the last 15 months,” she said as she handed him the prestigious trophy. 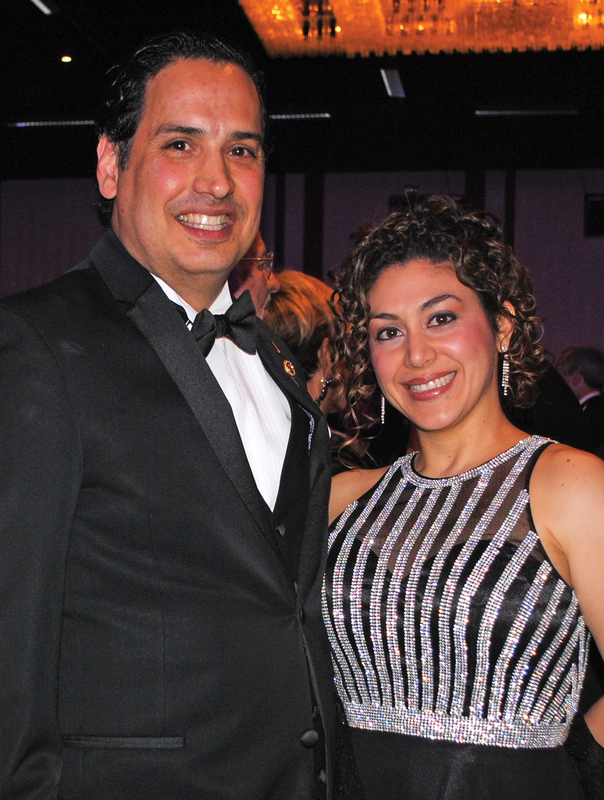 RNASA Chairman Rodolfo Gonzalez and his wife, Anangela, wear big smiles as they look over the massive crowd at the 2018 space gala. Looking around the Hyatt Regency Ballroom, you might have spotted former NASA Administrators Michael Griffin and and Gen. Charles Bolden; Glenn Research Center Director Dr. Janet Kavandi, acting NASA Associate Administrator Stephen Jurcyk, retired Johnson Space Center Director Mike Coats, and three other former Space Trophy winners — Eileen Collins, Glynn Lunney and Tommy Holloway taking their seats. The guest list read like a Who’s Who in the space industry and included JSC Deputy Director Mark Geyer, Associate Director Dr. George Nield, Space Station Program Manager Kirk Shireman, External Relations Director Deborah Conder, Safety Director Terry Wilcutt, Flight Operations Director Brian K. Kelly, Deputy CFO Sidney Schmidt and NASA Orion Program Manager Mark Kirasich – many with their spouses. 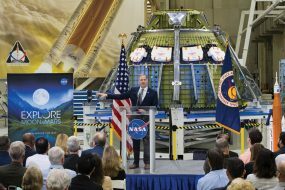 Other space luminaries included a number of astronauts such as Chief Astronaut Patrick Forrester and Mark Polansky, along with former astronauts — Texas A&M at Galveston COO Michael Fossum and Orbital ATK Systems Group President Frank Culbertson and Gen. Tom Stafford. Boeing’s Houston Site Leader and ISS Program Manager Mark Mulqueen was in the crowd, as were Barrios Technologies Chairman Sandy Johnson and President Robert McAfoos, Jacobs Vice President Lon Miller, Blue Orgin President Rob Meyerson, KBR Wyle Senior VP Dr. Vernon McDonald and VP Genie Bopp, MEI Technologies CEO David Cates and Alpha Space Test President Mark Gittleman. Plus, Bastion biggies Mike and Jorge Hernandez and COO Jay Ramakrishnan, UTC Aerospace Leader Allen Flynt, SAIC Vice President Charlie Stegemoeller, Lockheed Martin Orion Deputy Director Larry Price, MRI President and VP Debbie and Tim Kropp, Axiom Space President Mike Suffredini, ERC Partner Darryl Smith and Sierra Nevada Corp. Vice President Mark Sirangelo. 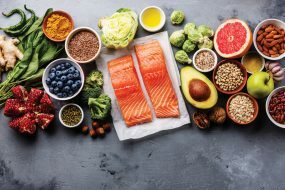 RNASA Foundation and Rotarians in the mix included RNASA Vice President Bill Taylor, John Branch, Bob Wren, Delia Stephens, Geoff Atwater, Frank Perez, Rich Jackson, Randy Straach, Mark Hollis, Duane Ross, Steve Oglesbee, Gary Johnson and their spouses. Museum Guild members Louise Russell, Jan Larson, Belinda Scheurich and Ava Galt, from left, who put in many hours working on the annual Silver Tea, wear big smiles as the crowd begins arriving at the museum in Clear Lake Park. BAY AREA MUSEUM was nearly overflowing Sunday, May 6 as the Museum Guild hosted the 33rd annual Silver Tea, which was founded in 1985 so local families could come together to experience a favorite British custom. Many cooked their favorite sweets and savories to share with the crowd, which included the Lunar Rendezvous princesses and lieutenants and their mothers, along with Museum Guild members and their families. Silver Tea Chairman Terri Monette was at the door to introduce the arriving crowd to this year’s honoree, Brandie Corrao, who was selected for her dedication to the museum. Nearby, you might have spotted Peggy Clause and Sandi Allbritton were busy complimenting Marjy Fulton on the beautiful tea cups she has made annually for the guild to sell at the tea. In no time, the museum began to fill with Matthew and Angie Weinman and Joy and Charles Smitherman in the arriving crowd, along with Emmeline Dodd and Gene Hollier, Annette Dwyer and her husband, Pat Monks, Mary Williams, Diana Dornak, Adrienne Sun, Mary Ann Baxter and Laura Sukkar. Some of the others out enjoying the afternoon included Museum Guild Co-Presidents Ava Galt and Carole Murphy, Jill Smitherman, Jill Williams Lammers, Barb Spencer, Cindy Kuenneke, Louise Russell, Gayle Nelson, Marcy Fryday, Sally Jordan and Jan Larson. 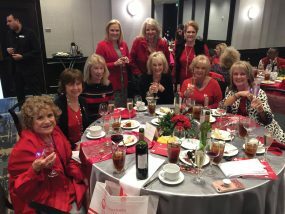 Houston Symphony League Bay Area officers for 2018 will include, from left, Historian Pat Biddle, President Nina McGlashan, Parliamentarian Lisa Clobanu and Corresponding Secretary Jean Raffetto. They were installed May 9 at their Bay Oaks Country Club luncheon. Recording Secretary Gayle Nelson and Nomination Chairman Mary Voigt are absent from the picture. NINA McGLASHAN is the new president of the Houston Symphony League Bay Area, which enjoys bringing beautiful music to the community and focuses on music education for elementary students in the Clear Creek School District. She’ll have six vice presidents lending a hand during the coming year — Carole Murphy, finance; Jim Moore, education; Patience Myers, development; Martha McWilliams, programs; Ann Morgan, membership; and President-elect Vicki Buxton. Other officers will be Recording Secretary Gayle Nelson, Corresponding Secretary Jean Raffetto, Historian Pat Biddle, Nomination Chairman Mary Voigt and Parliamentarian Lisa Clobanu. 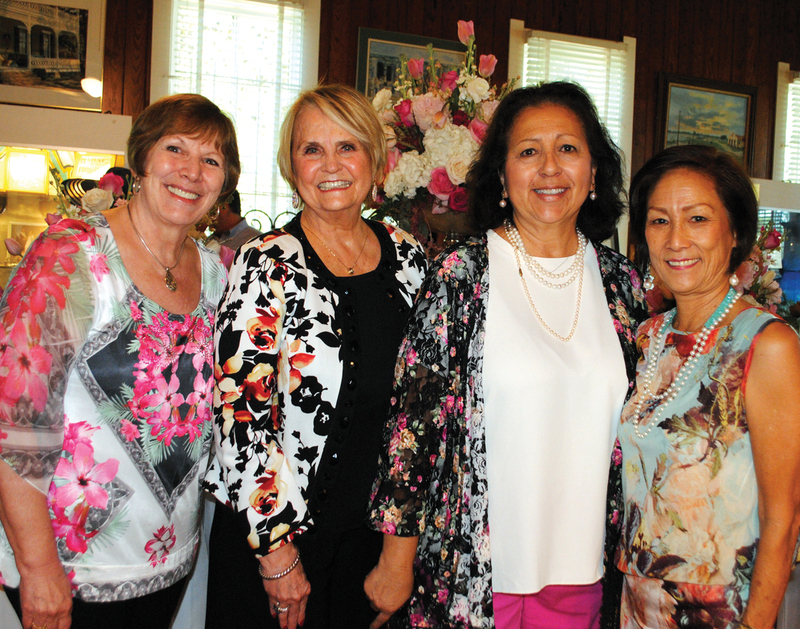 They were installed May 9 at their Bay Oaks Country Club luncheon. 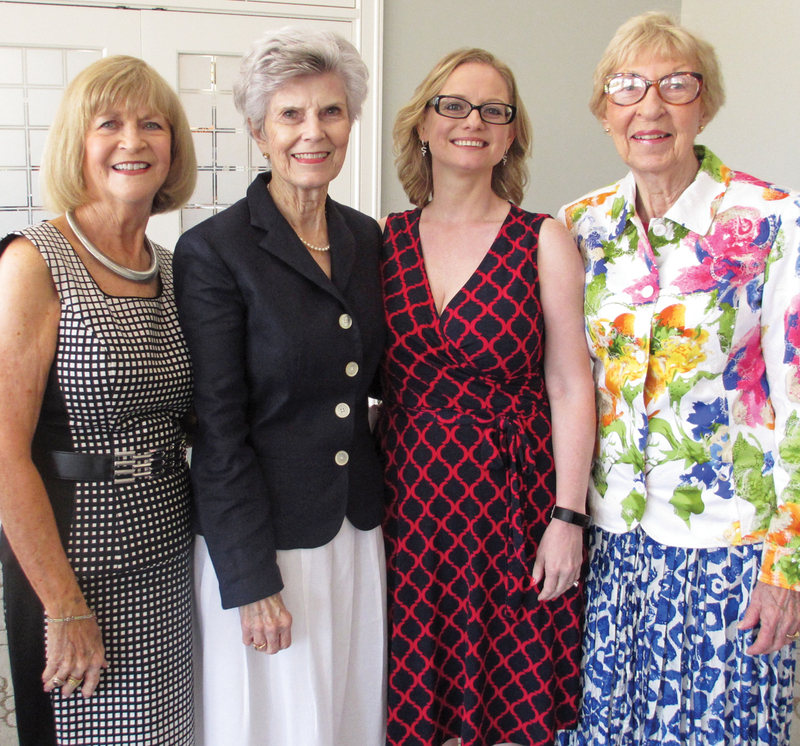 THE SAM HOUSTON Chapter of the Houston National Society of the Daughters of the American Revolution also introduced new officers when members met on May 5 at Bay Oaks Country Club in Clear Lake. New officers for 2018-2020 are Regent Beth Sears, 1st Vice Regent Sarah Adams, 2nd Vice Regent Rita Ash, Chaplain Susie Ganch, Recording Secretary Becky Miles, Corresponding Secretary Ann Caywood, Treasurer Kati Hill, Registrar Lara Phillips, Historian Julie McRee and Librarian Fran Bodden. Texas State Regent-Elect Susan Greene Tillman discussed the theme, “Are You Letting Your Light Shine?” Her speech focused on the many ways all DAR members can become involved in DAR, no matter their interests, talents and strengths. DAR is an organization that provides countless community service in projects helping veterans, libraries and schools.